Err… Great. Thanks. How’s work going on that new air conditioner. You know, the one that can freeze a person solid in half an hour? A NEW kind of glass used for the bulbs of ultra-violet lamps makes it possible to get a sunburn in 20 minutes. 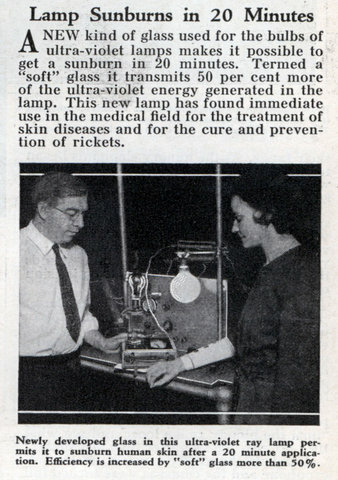 Termed a “soft” glass it transmits 50 per cent more of the ultra-violet energy generated in the lamp. This new lamp has found immediate use in the medical field for the treatment of skin diseases and for the cure and prevention of rickets.